The Samsung Galaxy S8, judging by the leaked images on bgr.com is a beautiful looking device. 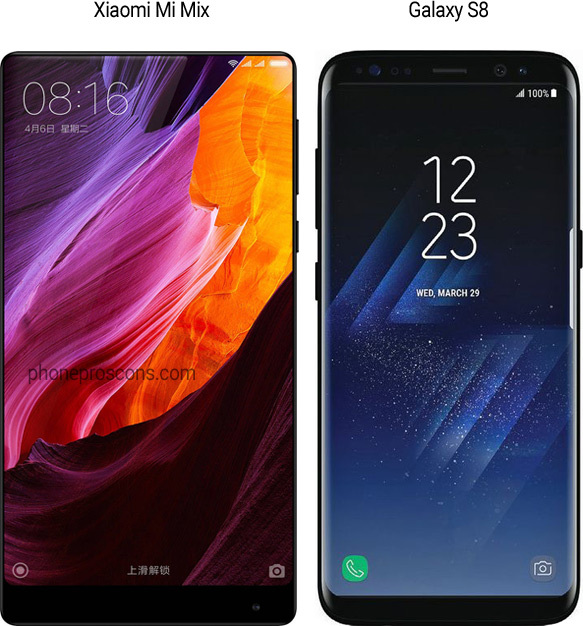 The first thing that I've noticed and I've read about it prior to these photos appearing on the web, is that the S8 uses the same 18:9 (2:1) aspect ratio display. You can clearly see that the device is longer than we usually get to see in smartphone, because of its unique aspect ratio. 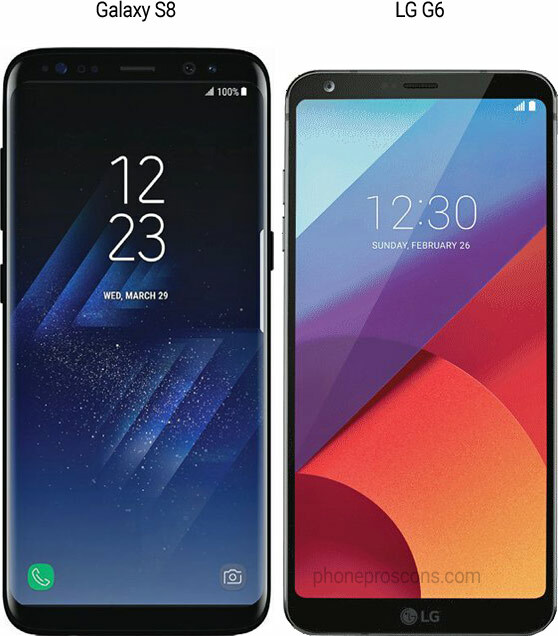 Here is just a side by side comparison (not real size comparison because we still don't know the exact dimensions of the S8). You can clearly see that the Galaxy S8 has very slim bezels and the 2.5D screen is wrapping around the edges, not as much as the S7 edge. Still, this really help to create a sleeker design compared to the LG G6. The Galaxy S8 screen also comes with rounded edges, which looks really nice. I love that in the G6 and also love how it looks on the S8. We can also see that Samsung kept the top and bottom bezels to the minimum. Still, it's not as innovative and impressive as the Xiaomi Mi Mix, but still impressive nevertheless. What Xiaomi did was to remove the earpiece part and use an advanced ceramic audio technology to transfer sound through the screen. They then removed the camera to the bottom and almost completely remove the top bezel. Samsung couldn't have done that because the Galaxy S8 now incorporates an Iris scanner alongside its front-facing camera. Keep in mind that the above images aren't real size, I just put them side by side to illustrate the design differences between those smartphones, not to show the actual relative size difference. I personally like the Xiaomi Mi Mix design best, but this definitely can limit its capabilities. I mean, what happens if Xiaomi wants to implement an Iris scanner like the S8 as well? Anyways, the thing that I most like about the design is how narrow it looks. The 2.5D edges are perfect fit for this device. Judging by the leaked images on bgr.com website, you can also see that the phone is very slim as well. The phone has a glass back that also curved at the edges, and those two front and back glass nicely wrap the phone and give it a nice simetric and modern look. As beautiful as it looks, I personally would definitely buy a case for it to protect its beauty, but trust me, I hate doing it. Everytime I remove the case from a phone that I got I'm always feel sorry using a case in the first place and not enjoying the phone's slim design. At the same time, I would be really upset if the Galaxy S8 would get a scratch. It's great to see a very thin bottom chin. I think that part is necessary to prevent people from accidentally triggering an even on the touchscreen. I think that some bezels are just necessary to maintain good functionality and ergonomics. I think that this is one reason why Samsung opted for more subtle rounded corners than the S7 edge. Overall, it's an amazing and sleek looking phone. We just couldn't ask for anything better from Samsung this year. Of course there will be some people who won't like it. In fact, I friend of mine hate those rounded edges and really liked the new LG G6 flat design. What do you think about the Samsung Galaxy S8 design?